Marjoram has a long history as an herb used in love spells and potions. The ancient Greeks and Romans crowned newly married couples with it to ensure happiness. The Greeks also believed that if a girl placed marjoram in her bed, Aphrodite would enter her dreams and reveal the identity of her future spouse. The Romans believed that marjoram had been touched by Venus who left her perfume in the herb to remind mortals of her beauty. Marjoram is a mint in the oregano family. The three main varieties are: sweet marjoram, an annual and preferred in the kitchen; wild or common marjoram, a perennial, the uses of which are primarily medicinal; and pot marjoram, a tender perennial also known as Cretan oregano, most often used in hanging baskets as an indoor winter plant, although some people do not like its balsamic fragrance. In the garden, sweet marjoram seeds are small and slow to germinate. It is best to start them indoors and then set them out when all danger of frost has passed. As with all herbs, choose a sunny location with well-drained soil. Be very diligent in your weeding as marjoram seedlings are small and easily overwhelmed. Medicinally, marjoram has digestive, antispasmodic, carminative, diaphoretic and diuretic qualities. Marjoram tea aids digestion, increases sweating and encourages menstruation. The herb has been shown to inhibit viruses such as herpes 1 and is an antioxidant that helps preserve foods containing it. 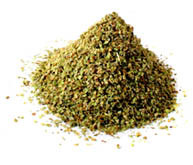 Used as a steam inhalant, marjoram clears the sinuses and helps relieve laryngitis. An infusion of weak marjoram tea is helpful for children's colic. In the kitchen, marjoram can be described as a mild oregano with a slightly balsamic flavor. It works well with all kinds of meats, fish, soups and egg and cheese dishes. It is one of the essential herbs in Italian cooking. Marjoram has a particular affinity for legumes and should be added to bean, split pea or lentil soup. It also enhances the flavor of most vegetables. Pound the chicken breasts to a uniform thickness. Rub them with the olive oil and lemon juice and sprinkle with the marjoram and pepper. Marinate in the refrigerator for at least one hour, but preferably longer. Heat a large frying pan with a little olive oil to medium-high. Add the chicken and cook until the breasts are done, but not overcooked, about 10-12 minutes, turning once. Combine the sour cream, yogurt, salt, pepper, dill and chives. Serve this sauce either over the chicken or as a condiment. Trim the tough ends of the asparagus. Steam the spears until just tender, about 5-10 minutes depending on their thickness. Be sure not to overcook. Drain the spears well and allow to cool to room temperature. Mash the blue cheese in a small bowl. Add the olive oil, lemon juice; sweet marjoram and salt and pepper. Spoon the dressing over the asparagus and serve at room temperature. Sauté the onion, potato, carrots and celery in the olive oil in a large saucepan over a medium heat for about 10 minutes. Add the stock, pasta, tomatoes and garlic and cook over a low heat for another 20 minutes. Then add the green beans, chard, zucchini, and white beans and cook for another 15 minutes. Finally add the marjoram and oregano and salt and pepper to taste. Cook for another 10 minutes and then add the cheese to each bowl when serving.